Alabama ST — American Tier VIII battleship. Alabama ST is a clone of Alabama that is rewarded to Supertesters at Wargaming's discretion. She is statistically identical to Alabama, but comes with a unique camouflage. Alabama is a Tier VIII American battleship that shares many characteristics with her tech tree counterpart, North Carolina. The most obvious similarity is that both share the identical 16-inch, 45-caliber guns mounted in triple turrets in an A-B-X configuration, as well as firing the same 13,100 damage AP shells. Both battleships also feature powerful suites of anti-aircraft guns that make them unappealing targets for same- or lower-tier aircraft carriers. Captains familiar with North Carolina’s primary, secondary, and AA armaments will feel right at home behind the helm of Alabama. Her 45 caliber gun shells are slow to land on target; extra lead is needed at range (similar to North Carolina). As a premium ship, Alabama ST doesn't have any upgrades to research. Slot 3 offers several options. AA Guns Modification 1 ( ) will boost her maximum AA strength, while Secondary Battery Modification 2 ( ) will boost the range and accuracy of secondaries instead. Artillery Plotting Room Modification 1 ( ) will increase range and give secondaries a slight boost in range and accuracy, but may be a weaker choice than the other two. Slot 5 Maximizing stealth is never a bad choice. With the Concealment Expert commander skill, Concealment System Modification 1 ( ), and appropriate camouflage, this ship can choose when to engage the enemy. For the Level 1 skills, there is no clear-cut choice as to which skill to pick first. Skills such as Preventative Maintenance and Priority target may help in terms of survivability, while other skills like Expert Loader may help in cases where a different target suddenly appears and you need to swap shell type. For the Level 2 skills, Expert Marksman is priority. The Alabama's turrets are quite slow, as with most battleships, and Expert Marksman will help remedy that. Other skills that may be useful are Adrenaline Rush for faster reload at low health and High Alert to get Damage Repair Party up faster. For the Level 3 skills, Superintendent should be the first choice. The extra heal is extremely handy to have in a battleship that may take a lot of damage from tanking enemy shells. Basic Firing Training is also helpful making the ship's AA even better than it already is. Basics of Survivability and Vigilance are also useful for survival purposes. For the Level 4 skills, either Concealment Expert or Advanced Firing Training are excellent first choices to take. Concealment Expert is useful for disengaging from fights and disappearing into stealth or for making flanking maneuvers against the enemy fleet. Advanced Firing Training extends the power of your excellent AA, allowing the Alabama to better protect yourself and your allies from aerial attacks. If desired, Manual Fire Control for AA Armament is an option for those who want to be an extra nuisance to enemy planes, however Advanced Firing Training is the better first pick for an AA build Alabama. Fire Prevention is also an option for players who feel that they take too much fire damage and would like to minimize fire damage as much as possible. 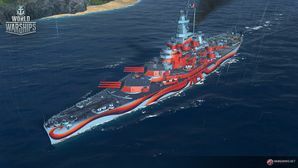 As a premium ship, Alabama comes included with Type 10 camouflage that lowers her detection radius, reduces the accuracy of incoming shells, and increases the amount of experience she earns. As with most ships, the Alabama has 8 slots for signal flags. The most important are the flags that enhance your survivability, which are India Delta, Sierra Mike, and India Yankee. There is also the option to mount November Echo Setteseven to enhance your already formidable AA or November Foxtrot to shorten the reload of consumables. After that, you can choose to mount flags that impact xp and credit income, such as Zulu, Zulu Hotel, Papa Papa, Equal Speed Charlie London, and Dragon Flag. Both Alabamas demolish an enemy Gearing-class destroyer. Alabama bounces an enemy North Carolina battleship's shells. Alabama was decommissioned on 9 January 1947, and joined the United States Pacific Reserve Fleet, remaining there until she was struck from the Naval Vessel Register on 1 June 1962. Citizens of the state of Alabama formed the “USS Alabama Battleship Commission”, which raised funds to secure the preservation of Alabama as a wartime memorial. She was awarded to the state of Alabama on 16 June 1964, and was towed to her permanent berth at Mobile, Alabama. Arriving in Mobile Bay on 14 September 1964, Alabama has remained "in service" as an open museum ship ever since. This page was last modified on 19 February 2019, at 05:48.